Hi all, right so following on from my numerous posts in this section of the forum i have started honing, at the moment a £10 5/8" Hamburg ring from ebay, and i think it's going reasonably well, i shaved off of it anyway! So questions, due to budgetary constraints i currently only have a Naniwa combination stone, 1000 grit one side and 3000 grit the other, and having spent some time on these i then stropped the blade on canvas with some chromium oxide and then on plain leather before shaving, and the shave was okay, i could feel that it wasn't as smooth as the blade i got off of @Fergiebilly but the finish was nearly as good, i managed 3 passes including ATG with out major incident. So getting the blade to feel smoother on the skin, is this just a case of using higher grit stones or lapping paper or should i go back to the 3000 and alter the pressure i apply to the blade whilst honing? A 3000 Grit is WAY Too Low a Stone to Shave Off by a Mile..Big Time..Those 2 Grits You are Using Fall into the Bevel Hone Stage..You Need a 5 K 8 K 12 K.. Thanks (as always) for your swift reply, yeah i know that they are too low really, i just couldn't resist a cheeky shave with something that i honed myself my plan was to get the stones and lapping film that you mentioned in one of my previous threads, but the lapping film will have to wait until next payday, so will using the higher grits smooth things out? Does the fact that i achieved a shave indicate that the bevel is significantly set? Well..Its a Good Sign for Sure..Its Always Hard to Comment as Folks Do Strange things to Get Em to Shave & then they Dont Hold an Edge..The Pics here Show what a Proper Bevel Set Kinda Looks Like from Heel to Toe..Thats What You are Looking For..A Solid Bevel from Heel to Toe.. Thanks. I'll wait on getting the lapping film and report back. Hi Bazz, thanks for the rambling. I've spent plenty of time doing that, its all part of the process. Occasionally though, I've found that through rambling around and experimentation, you do have the odd light bulb moment. Like today for example, you got me thinking about the Nani 1/3k combo. I bought one as a first hone and haven't used it much for a while....until today! Since buying it I have acquired quite a few hones and tried many different progressions. Anyway today I decided to lap the ole Nani 1/3 both sides using a DMT D8C. What a good hone this is once nicely flattened. I went to work on a Ralf Aust 5\8 fairly new but in need of sharpening. Taped it up and gave it a good few circles and x strokes on the 1k. Then similarly the same on the 3k. Then ran the edge along a glass jar to bread knife it (3 blade weight passes). Then back to the 3k after a brief re flatten with the DMT. I did perhaps 25-30 strokes on the 3k with a light slurry made with a piece of welsh slate hone off eBay and then tested the edge on my leg hair. Wow... hairs pinging off midway no bother. I happened to carry on to the Norton 8k then Shapton 16k, but..... I reckon if I'd stropped for a good while (60-100 strokes on leather) after the nani 3k, I would have got a half decent shave. A far better shave IMHO than I would have of the Norton 4k or most the intermediates I've bought. my progression big time, thanks to you. Thanks for the reply @Johnjo , and remarkable timing as I just today sorted out the rest of my progression with lapping film, until I can afford more hones. I purchased an A4 piece of 12mm thick Perspex and cut that into 4 equal pieces that are the size of a good hone and then progressed to stick to them 9, 5, 3 and 1 micron lapping films. I went through this progression with the two razors that I have to practice on and it has made a remarkable difference. 1 of them still needs some more work but the other is wickedly sharp, so much so that I now have a chunk missing out of my strop after the lightest of mishaps! A question for you if you don't mind, I read somewhere on the web (can't remember where now) that if your doing more than 12-15 laps on your progression stones then your doing too much. Now I have rule of not believing anything I read on the web unless it's corroborated by other sources, what's your take on this? Around 95 % of what I Read on Forums about Honing is a Load of Mince..Just Like the BBC News..Every Razor on the Hone is a One Off..There are NO..One Size Fits All.. Hard & Fast Rules.. Thanks Bazz, to be honest I don't have the experience to be able to say whether that's true or not. If the person saying that has the experience and ability to make that work then it's probably true. I just go by what feels right by my own limited experience with honing. I'm 4 years in and still experimenting and still getting varying results but still learning and still enjoying the journey. I shave typically every 2-3 days and am always critical of my edge even if it's pretty smooth. 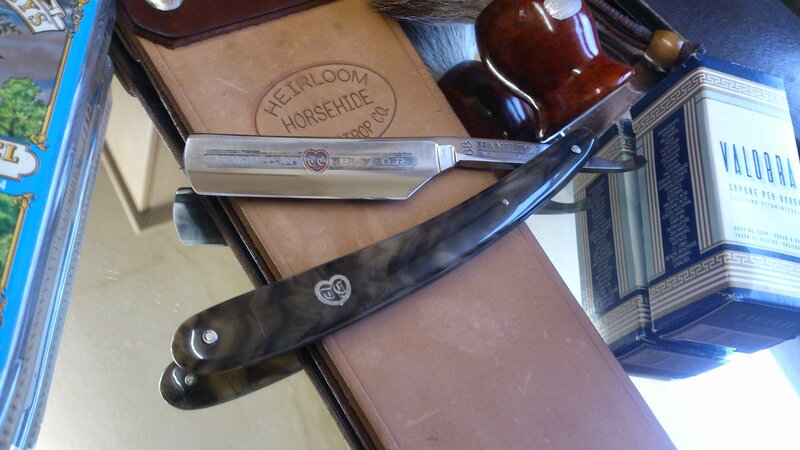 I also find that the best shaves I get come after the 2nd or 3rd shave after honing. Whether or not that's about my ability to strop properly or not I don't know either. Some say strop a lot and some say you barely need to strop if you hone well??? I just keep practising and trying new progressions and then try to remember what I did when I get a really smooth shave..... mostly though, I get pretty good results without too much razor burn, which is well nasty! BTW good effort with the perspex and lapping film. let us know how that develops. Tasty looking strop Billy, where's that from? Thank You..Its a High End Tony Miller Heirloom Strop from the USA..They Dont Make this Particular One Anymore..I Got it on EBay for a Song an All..
feck off. 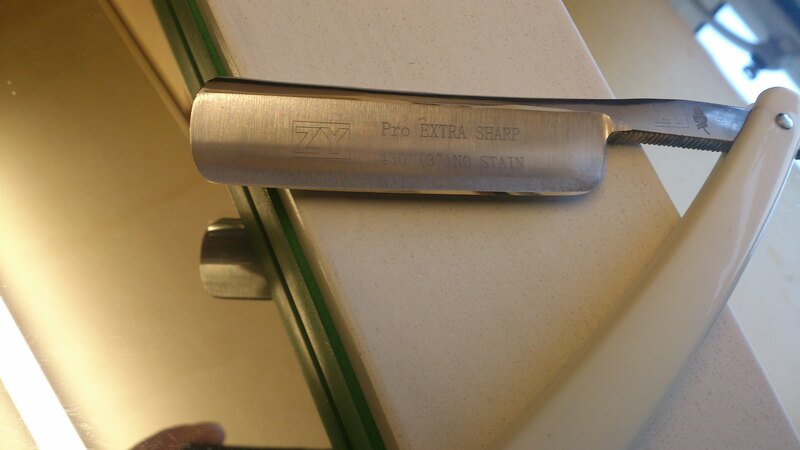 I use a 200 grit to shave. 10 mins of rubbing on the fizzog no hair left. costs NHS a fortune though. skin grafts are not cheap.